Piper is working in voice over for this episode while she draws pictures of her life on a whiteboard. PIPER: Hey guys, Piper here. 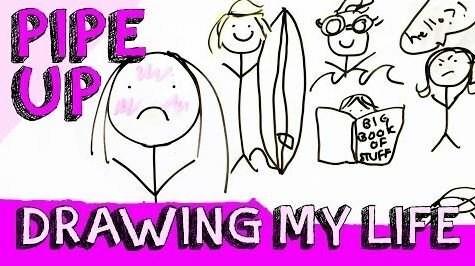 So, today I'm going to be drawing the story of my life. She draws her name on the whiteboard. PIPER: My name is Piper Marilee Willis. Sometimes knows as Pipes or Pipsqueak or Pip, but don't you dare think about calling me that because, they're family names and they were given to me when I was just a bub. A wee bub. A wee baguette. This baby looks like a baguette. I didn't look like a baguette, I just can't draw. And even then, Imogen swears that I had a terrifying death stare and I also had...apparently...a monobrow. It was 1999, what can I say? I didn't know better. She draws a map of Australia. PIPER: ...watersports, and animals. Actually, I had a pet penguin once. His name was Peter. I desperately wanted a pet penguin, so every time we went to the beach, Dad was like, 'There he is! There's your pet!' And looking back on it, I'm pretty sure it was a different bird every time, but Dad insisted it was my little Peter. Word of warning, though, don't let your children pet penguins! Or any bird for that matter because...they don't like it. She draws a picture of herself. PIPER: Do I miss the beach? Um...no. I don't like the beach. But my whole family does...I had a very watery upbringing. That sounded weird. She draws herself as a mermaid. PIPER: Not like a...mermaid...I was by no means a mermaid. But my Dad surfed, my brother was a swimmer, we were always swimming. I also have a sister, Imogen, and I have another brother Ned, but he lived with my Dad's ex, Beth. So, growing up I really didn't see him that much...but...I've been seeing a lot more of him now that I'm older. And of age. So, if you could give me another tattoo, Ned, that would be great, if you're watching this! She erases the picture of the family. She draws herself wearing a bobble hat. She draws the Canadian flag. PIPER: But it was great! No longer was I the black sheep of the family. I was the black sheep of someone else's family! I still really miss my friends, though, in Point Grey...hit me up on Facebook...most of them...although...I do really miss Tim Horton. Not a guy, by the way, just realised that sounded like I was talking about a guy! Tyler, you can relax! This is a little shout- out for my favourite cafe...Bay City audience, if you're listening, you'll know what I'm talking about. Tim Horton is a coffee shop. And it has *the best* white hot chocolate in the world, like, Harold's needs to get on it! Why am I talking about food? Now I'm hungry! BRB. There are sounds of Piper eating quickly. PIPER: Where were we? Um...food...now! She draws Tyler with long hair. She draws Tyler with a man- bun. PIPER: ...yes, Tyler has a man- bun. No, he doesn't look like the grandma from Mulan...well, not yet anyway! Um, he's pretty much the most important person in my life. PIPER: After, you know who I'm talking about, Mum, if you're listening...sorry, you know it's true! You know it's true. #ETCAT. So what about the future? What's in store, what does it bring? Who knows? Right now, though, I'm enjoying YouTubing and being independent for the second time in my life. And school's almost over...school is soon to be a distant memory, I'm going to be able to start my career in media, Buzzfeed, I'm looking at you! She draws a cat with a keyboard. PIPER: Anyway, guys, thank you so much for watching, I really hope that you enjoyed this style of video! If you haven't already, hit the Subscribe button, I make new videos every week, thumbs up, comment down below and...I will see you all soon! Navidenou!